British Cycling launched the campaign #TurningTheCorner. A campaign to simplify the rules around turning at junctions, to make it safe for cyclists and pedestrians and to reduce casualties. I can’t fault the idea of making the roads safer. I’m 100% behind that. However I am concerned with how this is actually going to be implemented. If we look at countries which already have such rules in place, they usually A. have better infrastructure. B. the rules have been established for a while C. More people cycle, more people know people who cycle and generally cycling is more accepted, as such people are more aware. 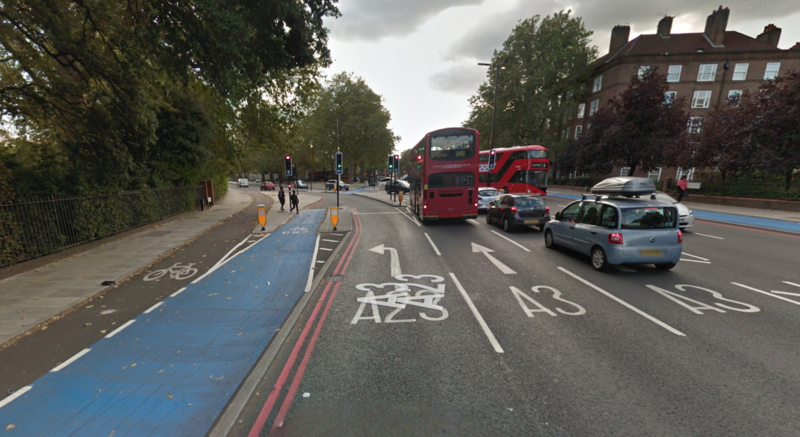 I can just see now a stream of cyclists going northbound on CS7 past Clapham Common on approach to Rookery Road and a vehicle waiting to turn left, they will be there for one hell of a time. Approach speeds can easily be greater than 20mph and I would struggle to trust a driver to not turn across the path of the cyclists. And I have many more examples of exactly the same at this junction. We have a real life example of how a change to the road can fix this. A few years ago I witnessed a truck overtaking a cyclist at Oval and turning left across her, it very nearly resulted in her going under the wheels of said truck. Read about that case. The junction as it used to be, cyclists going straight had to share a lane with motorists turning left. The junction now is very different, cyclists are separated from motor traffic and turning cars have a different phase of light. One way the dutch do it (when space is available) is fantastic. The turning traffic is 90 degrees to the cyclists, and as such do not need to rely on their mirrors to see cyclists, they look out their side windows and windscreen. Cyclists in this situation have priority and cars can only go when it is clear for them to do so. To summarise. Changes need to be made, and London has been making some fantastic changes recently that has resulted in an increase in people cycling. But we need to improve the areas that don’t have such facilities and the rest of the country. I know that personally I would be cautious of passing a left indicating vehicle on the left, even if the law states that they must wait for me to pass. 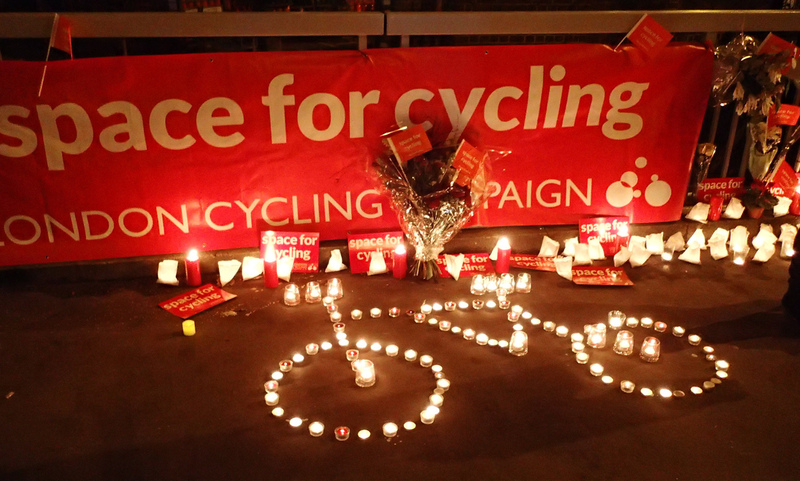 I was watching BBC News yesterday morning, and Boris Johnson was on speaking about the 5 cycling deaths we have had on London’s roads in only 9 days! Year on year cycle deaths are down. Cycling numbers are also up, which means it is better. This isn’t a case of being better, it doesn’t matter if it’s gone done and it certainly doesn’t matter if numbers are up. The point is that people are dying on our streets. Dying on their way to work. dying on their way home. These people are dying and nothing is being done! Our streets are built on 1960’s philosophy of car is king, everyone uses them to get everywhere. That isn’t the case, our roads need to be re-designed to suit the needs of everyone that travels on them. To keep everyone safe and to allow all road users to get to their destination without fearing their life when they get to a certain junction. I was at the vigil the other day for Venera Minakhmetova. The LCC where going to attempt to have 2 minutes silence for those that had recently died. Unfortunately the motorists we where preventing from continuing their journeys didn’t appreciate it and leant on their horns, this ruined the silence. Of course, these motorists only days before probably took 2 minutes out of their day to remember our fallen war heroes. But as soon as they get behind the wheel, seem to become different people and forget about others. Boris needs to up his game, things have got to change, yes it will cost money, yes it will change how some people use our roads but we need to build a sustainable city for everyone to use what ever mode of transport they use. 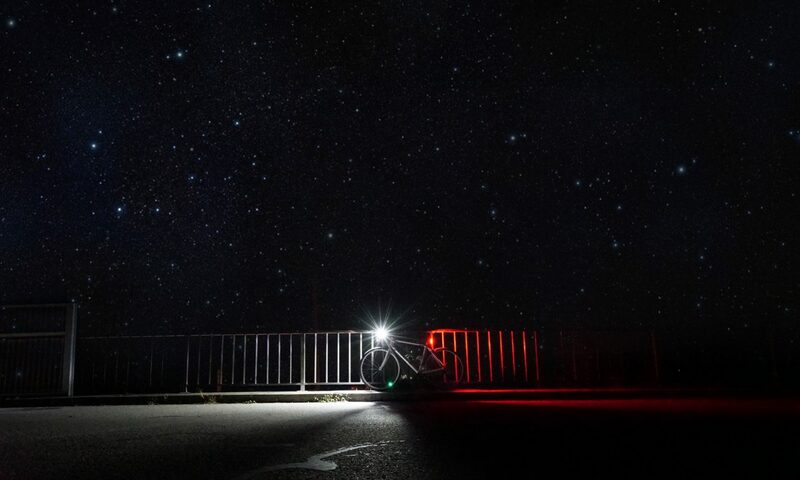 Other cities around the world are host to many cyclists and easily get through the year with zero cycling fatalities, why can’t London be the same? I’m sure many of my subscribers recall this incident and are wondering what was happening with it. Several weeks ago I was in court as a witness for it. The driver was found guilty of Careless Driving, 3 points on his license, £200 fine, £140 court costs and £15 victim surcharge. This incident has been much more than just that result, I’ve known what has been happening behind the scenes for quite some time. Those who use RoadSafe London will know that there was a change in how things were handled late last year, a change that many of us appreciated! This was the first incident to be dealt with under the change, and potentially the turning point. When I originally reported this incident I was left with no feedback and when I chased about it I still had no feedback. After contacting an officer who I knew had previously worked with roadsafe the report was chased up and I was put in touch with PC Walters. From there I gave a statement and provided footage. This was different to before, others and I had previously been to RoadSafe HQ to meet with the staff and talk about the system but this was a different approach. The company failed to respond to any form of contact and that isn’t just from my self but from many of the people who viewed the video. They were inundated with e-mails and didn’t know how to respond. This goes to show that a company vehicle with contact information on it is a massive advertising board, if you drive in a manner which people deem to be dangerous then the company will be contacted. 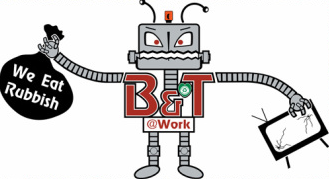 I did not put details about how to contact the company or ask people to contact the company in my video description, people did it on their own accord. PC Walters visited the company to get details on who was driving at the time. The company had been making improvements to its fleet, including improved driver training and putting “Look out for cyclists” stickers on the dashboard of their vehicles. VOSA visited the company and checked on everything, I don’t know anything apart from that and I believe that happened after the improved driver training and stickers. Despite the clear video footage of what happened, the defendant originally pleaded not guilty to careless driving. It went in front of a magistrate and the defendant and witnesses were questioned. The defendant said that he was distracted by a van that sped past him and took the same turning as him, he had to slow down and sound his horn as a warning. The horn is on the same stalk as the indicator and he was unable to indicate earlier. 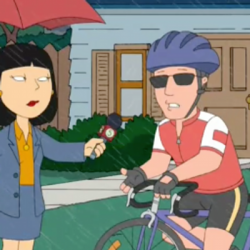 The defendant said that he thought the cyclist was taking the same turning as he was. He mentioned his professional driving experience of over 20 years and training he was undertaking to drive bigger vehicles. As I left the court room, the driver said “Watch yourself out there” to me and his brother gave me a sinister look. Probably not the best thing to do when a waiting room is filled with several police officers. 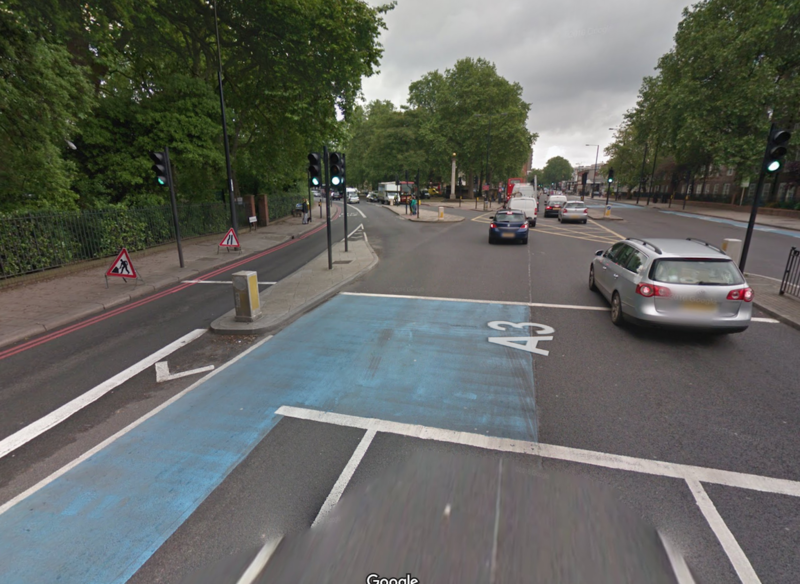 This can be a confusing road layout for someone who has not ridden it and is one that has been raised on several occasions as a danger spot to TFL, I raised in back in 2010 when I spoke to the manager of CS7 and CS3. Cyclists following the road round to the left would stay in the bus lane. Cyclists following the road straight ahead need to merge into lane 1. Drivers following the road round to the left need to be in lane 1. Drivers following the road straight ahead need to be in lane 1, 2 or 3. And there is the problem. A cyclist wishing to continue straight ahead must merge into the same lane as traffic that is wishing to turn left. A strong position is required in the lane and taking it as early as possible is the best approach. However with motorists zooming past and cutting in front of you, this is daunting for many cyclists and ultimately motorists feel as though they can push past when really they shouldn’t. The work that was undertaken by the Police was fantastic and something I had not seen or heard of before with a non-collision cycling incident caught on camera. The punishment I believe was fair given previous punishments we have seen with video footage but perhaps there is still an underlying exceptional hardship taken on drivers. I’m sure many will say that they believe that the driver should have lost his license. The work that the company did to improve their drivers was something I was not expecting and I think they deserve credit for that! Olympic Lanes have been popping up all over London, the aim is for them to get Olympic officials and athletes across London in a timely fashion. To do this they have taken away road space from other road users and created lanes which only Olympic vehicles can use. TFL are advising people to avoid using the roads in London throughout the Olympics due to the expected congestion. 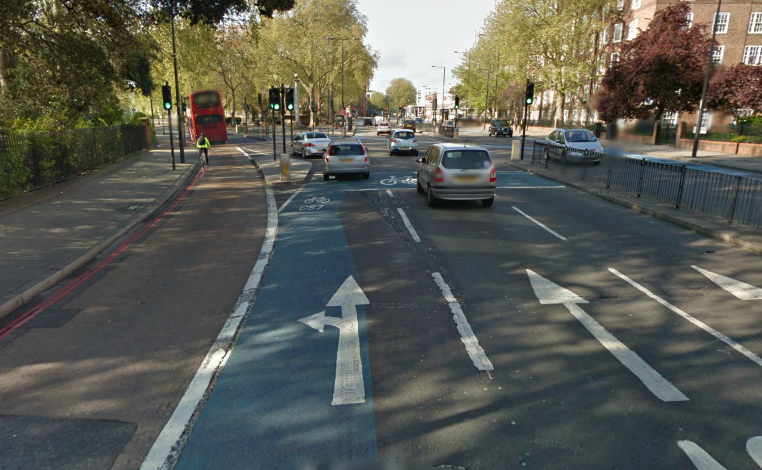 We can somehow take away road space for these olympic lanes but we can’t take away road space for cycle lanes. As was pointed out on As Easy As Riding A Bike, the physical constraints of London’s roads are few and far between. I was confused by the actions of Boris Johnson in early 2011 when he completed removed a huge section of the congestion charge zone. I would have thought the sensible action would be to increase it, to dissuade people from using private 4 wheeled vehicles in the capital. If we make driving in London undesirable by making it slow, have less space and expensive. Then we can improve the quality of London for everyone. There will be less traffic, less pollution and fewer people injured. However I fear it is not going to be that simple, this sort of change will require a huge overhaul in the thinking of TFL and Londoners.